Austin – Preservation Texas announced today that Evan Thompson of Charleston, South Carolina will assume leadership duties as executive director for the Austin-based statewide organization on April 1. 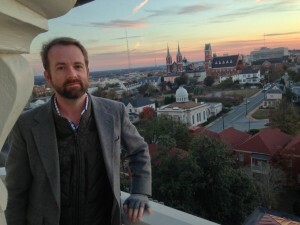 Thompson previously served as executive director of the Preservation Society of Charleston and Historic Beaufort Foundation in Beaufort, South Carolina. In Charleston, Thompson led the Society through complicated legal advocacy while developing important outreach programs through continuing education, recognition of African-American heritage, and solutions-based approaches to preservation challenges from abandoned cemeteries to underappreciated vernacular architecture. In 2010, he was recognized by the South Carolina legislature in 2010 for his preservation efforts in South Carolina. Thompson will announce Preservation Texas’ 2014 Most Endangered Places on the South Steps of the Texas Capitol on May 20, calling attention to Texas treasures in need of the investment of intellectual and monetary resources to ensure their preservation.